Hi Friends!! I am in full on valentine mode! I love this special day of celebrating those you love...I think you should tell/show them everyday, but having that one special day to get as mushy as you want is pretty fun. I am not much of a cardmaker, so normally, as much as I hate to admit it, I end up buying valentine's for my family. This year though, I am determined to make them. They may be simple, but they will be from my heart, and that's what it's all about! So, when I saw the cut apart paper from Jillibean Soup in the Book Of Love kit from Noel Mignon, I knew this was going to help me a TON! 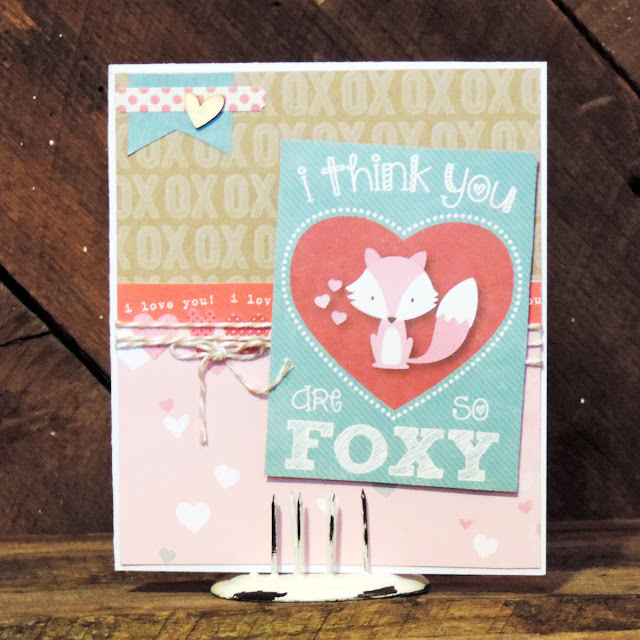 Then I saw the " So Foxy" card and knew it would be perfect for my hubby...anybody that knows us knows that that is SO us. Simple, but cute, right? I think he will love it....even though my 5 year old informed me that, "it's way too pink for Daddy!" lol. Don't forget to join us next week for our Book of Love crop on the Noel Mignon facebook group!! It's going to be a blast!!! This is a great card Amanda. I'm sure your husband will love it.